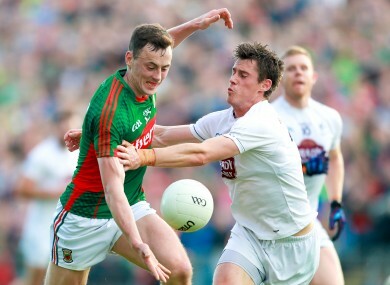 Mayo's Diarmuid O'Connor in action against Kildare's Emmet Bolton. A LATE SURGE before half-time from Mayo saw them go in leading by 2-9 to 0-5 at the turnaround in Castlebar on Saturday night. Evan Regan and Diarmuid O’Connor kicked 1-3 each in the opening 35 minutes of a contest played out in glorious sunshine in front of a crowd of 14,557. Mayo hit the ground running early on and were leading by 0-5 to 0-1 after 11 minutes thanks to three excellent points by last year’s Young Footballer of the Year and two more from frees from his older brother, with Cathal McNally getting one in reply for Cian O’Neill’s side. Over the next 11 minutes the visitors outscored Mayo by 0-4 to 0-1 to leave just one between the sides thanks a brace of points from both Morgan O’Flaherty and Neil Flynn. Mayo will feel they could have had two penalties in the first half, but that was forgotten as soon as Evan Regan tapped the ball home following some good work by Andy Moran, creating space for himself only to see his effort blocked by Mark Donnellan. Mayo’s second goal was something to remember with Diarmuid O’Connor gliding by three Kildare defenders as he cut in from the right-hand side of the field after picking the ball up from big brother Cillian out beyond the 45m line, before he finished it low to the net. Kildare needed to get a goal early in the second half if they were going to get back into this game and they came close on 41 minutes when Eoin O’Flaherty got in behind the cover, but his effort was brilliantly blocked by Colm Boyle diving at his feet. The opening 15 minutes of the second half saw both sides kick four points as Mayo looked to see out the game and try something different out in the shape of Aidan O’Shea patrolling in the full-back position. The game petered out to its conclusion without much fan-fare, with Mayo’s subs Jason Doherty, Alan Freeman and Conor O’Shea raising the white flag down the home stretch as Mayo ran out nine-point winners and now move on to the last 12 in the country. 15. Cillian O’Connor (Ballintubber, captain). Subs: 19. Stephen Coen (Hollymount-Carramore) for Keane (41), 22. Alan Dillon (Ballintubber) for A Moran (50), 20. Barry Moran (Castlebar Mitchels) for Boyle (BC, 53), J Doherty (Burrishoole) for B Harrision (63), A Freeman (Aghamore) for E Regan (65), C O’Shea (Breaffy) for D O’Connor (67). Subs: 19. Fionn Dowling (Suncroft) for Bolton (35), 25. Keith Cribbin (Johnstownbridge) for M O’Flaherty, 20. Alan Smith (Sarsfields) for E O’Flaherty (44) , 22. Eammon Callaghan (Nass) for McNally (48), 17. Peter Kelly (Two Mile House) for Fitzpatick (53), 21. Chris Healy (Two Mile House) for Flynn (59). Email “O'Connor stars as Mayo cruise past Kildare”. Feedback on “O'Connor stars as Mayo cruise past Kildare”.